We were pretty tired when we got back to Baku on Sunday evening, and decided that we'd have our dinner in the hotel restaurant. Conversation was in short supply, and given that I decided to do some last minute research on my mobile phone to see if I could turn up any more roller coasters in the general vicinity of Baku. 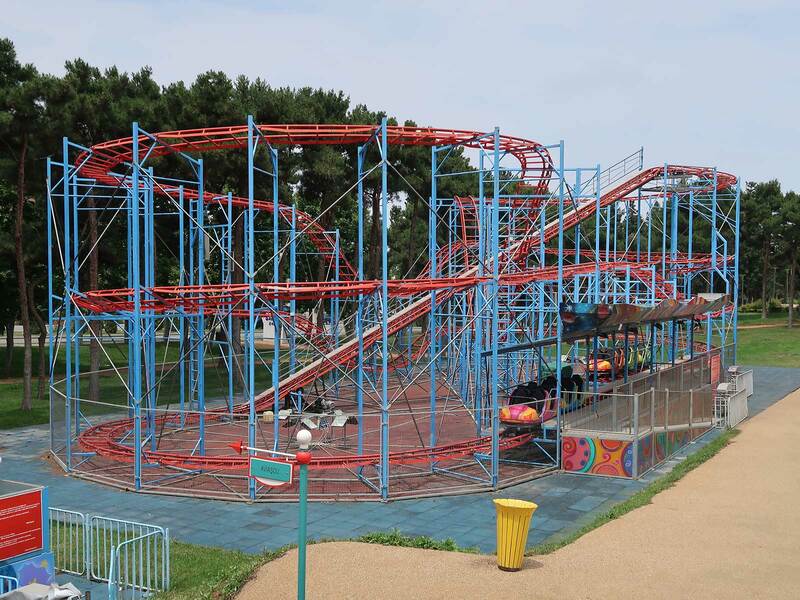 Ten minutes with Google revealed a page that mentioned Shamkir Amusement Centre, home to what was described as the first roller coaster in Azerbaijan. Though a good five hours from Baku it was a much more manageable thirty minutes from a park we were planning to go to anyway, and thus we decided to call in. The park Facebook page gave opening hours as 10:00-23:30 seven days per week. This was accurate, but incomplete; when we arrived at around noon we found only a subset of rides open: a set of swings, bumper cars, and a child-sized pirate ship. There were a bunch of other attractions in operational condition, including a giant wheel, a drop tower, and a coaster, but all stood idle. Anita managed some rudimentary communication in Russian with one of the staff on duty, which revealed that the major rides only operate on weekends; those attempting to retrace our steps should plan accordingly. There is one main road between Shamkir and Ganja, and it appears to be the go-to location for those seeking Azeri furniture. We counted a total of thirty-seven purveyors of mebel along the thirty-five kilometer stretch, and there were a number of buildings under construction that might up that number sooner rather than later. IKEA has not entered the Azeri market, and the general consensus is that they never will. Heydar Aliyev Park is a large public park in central Ganja built around a cultural exhibit dedicated to the memory of the third President of Azerbaijan. This can be found at the end of a seven hundred metre long tree-lined walkway with an enormous arch at its entrance that bears more than a passing resemblance to the Arc du Triomphe in Paris. The place has two sets of amusement rides. The first (40.6858, 46.3272) is small with no discernable name, and to be honest there is nothing there to draw in international enthusiasts. The second (40.6820, 46.3228) is Gancland Park, a collection of over thirty attractions with two roller coasters and a variety of full size flat rides. Enthusiasts retracing our steps may want to use the dedicated parking lot for the amusements (40.6798, 46.3207) which is a short walk from the coasters; it costs half a manat (€0.25) to exit. 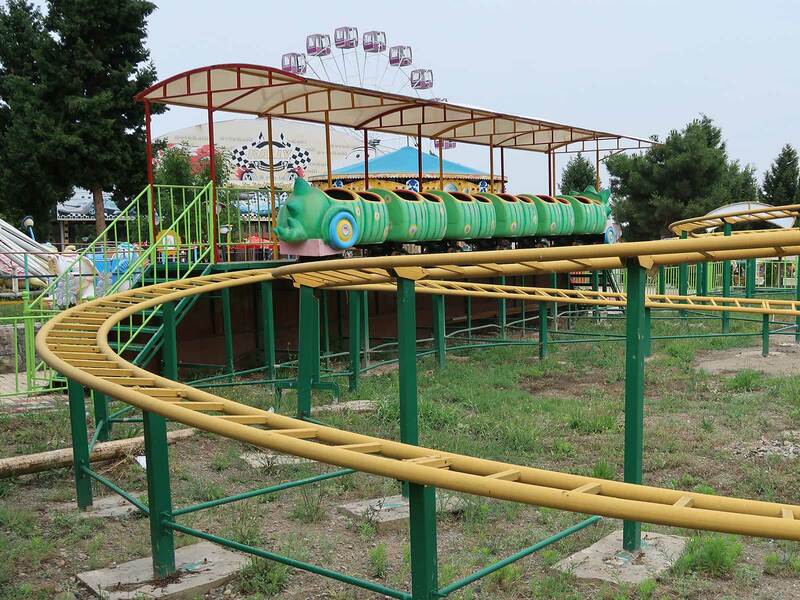 The first coaster we reached was Alma Qurdu, a Chinese-built family ride that was in an advanced state of non-functionality. Closer inspection led us to conclude that it has never operated; there were no wheel marks on the rail, at least two missing tyre drive motors, pieces of cement stuck to the track, no brakes of any kind, and a thick layer of dust on the station platform. There was a rather noisy compressor running in the track area that was making a spirited effort to shake loose from its mounting bolts; we presume that it must be feeding a different attraction somewhere in the vicinity. Our day to this point had featured around six hours of driving for no coasters, and given that it was a huge relief to find Amerikan Təpəcikləri (#2431) both operational and open. Our research had indicated a carnival ride of Italian origin, and this data was quickly confirmed when we spotted the words sensore, cavo, and fine corsa painted on different brake components. Though not a top ten ride by any means I can report that the experience was smooth and fun, with moderate airtime in places. We completed four laps, giving each of us a chance to experience each seat (though there was no obvious difference between locations). As we continued to explore we encountered a large group of local children. Though friendly at first, our initial willingness to pose in their photographs evaporated as they became quite overbearing in their attempts to get us to repeat a word in the local patois, which was almost certainly an obscenity. It eventually got to the point where we had to be extremely firm with them, and while this worked it still put a definite damper on our day. There were parts of the park that we didn't get to photograph in full, though we were able to compensate at least in part with overhead shots from the Giant Wheel. We very much enjoyed our time in Azerbaijan, aside from the brief problems with aggressive children. The vast majority of people we dealt with were friendly and helpful, and the prices were extremely cheap compared to home; premium fuel from full service stations cost just 1.25 manat (~€0.63) per litre, and vodka was a particular bargain with two litre bottles available for around 4 manat (~€2). 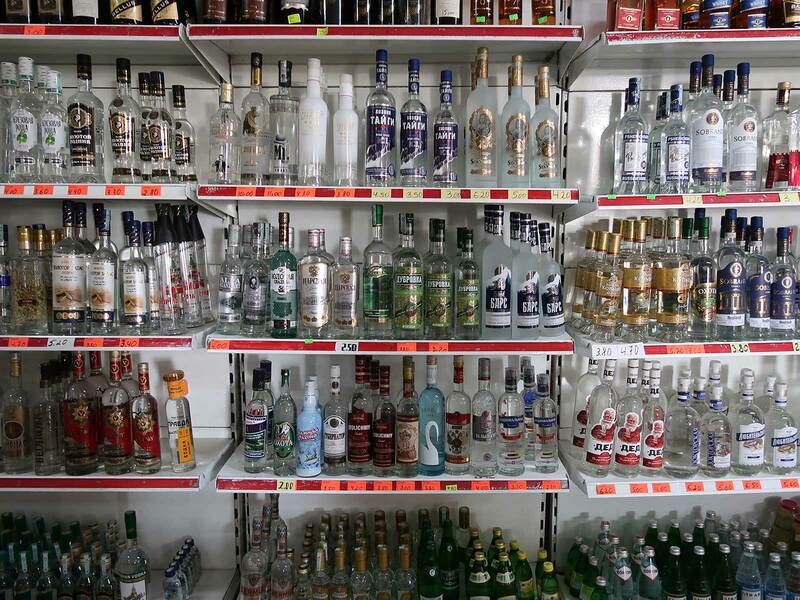 I am not a drinker, and as such I can't speak to the quality of the spirits available, though at that price I imagine it probably doesn't matter all that much! I found Baku to be a very pleasant city, being modern, clean, and architecturally interesting. The only warning I'd give is to those who want to explore on foot: there is a definite paucity of traffic lights, and as such it is a good idea to plan routes in advance using Google Maps or similar. The area around Baku Boulevard is particularly challenging for pedestrians, as there are six traffic lanes in each direction and the cars simply do not stop. Real-life frogger is possible for those with a death wish, but discouraged; it's a much better idea to use underground walkways that are placed every kilometre or two. Motorists should be aware that there is no such thing as an off-peak time in Baku; we were unable to find anywhere to leave the car in the downtown area on Sunday evening, and the one parking garage that we saw had a queue of at least twenty cars waiting at the entrance for vacancies. The driving standard is somewhat enthusiastic within cities; those of a nervous disposition should probably confine themselves to cross country routes. The only thing we found really problematic was the motorway speed limit, which alternated between 90km/h and 110km/h with rigid speed camera enforcement. Having to brake and reset the cruise control every minute or two made long journeys much more painful than they otherwise would have been.